They’re all here! Lionel, MTH, Atlas O, American Models and more. 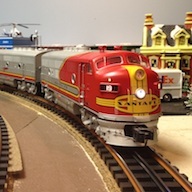 This page contains links to all of the major manufacturers of Toy Trains that we collect and operate, and a brief description of what each company produces. We also include some of the smaller producers who specialize in custom decorating and other specialty product lines. Ron, the founder of American Models received his first American Flyer S scale train set in 1953. Sometime after about 1975 he came to find S scale almost extinct and the AC Gilbert Co. out of business. In finding a small magazine he realized there was still a group of people modeling in this scale, however he was disappointed in the lack of ready to run items for sale and only repainted American flyer equipment. After checking with tool and die makers and the costs involved got him thinking about making just one locomotive. So he convinced his wife of the need to sell their large house, take out the cash and put it into tooling for the FP-7 locomotive. As providence would have it, friends were made in the tooling business, these friends taught him most aspects of the tool making trade. He even worked on his own molds in their shops. Editor’s note – Atlas O has produced three CTTA limited-edition 8,000 & 11,000 Tank Cars, and eight CTTA Woodside Reefer boxcar models. See our Club Cars page! Bachmann Trains is now known for its extensive and award-winning line of model railroading products, providing innovative design and high-quality products at affordable prices. The Williams™ by Bachman® line includes Traditional Line O gauge trains as well as the Golden Memories series that reproduces the iconic trains of the postwar era for today’s hobbyist, built to pass on to future generations. For close to a quarter century, since 1993, Buffalo Creek Graphics has been involved in the design and production of limited edition, custom run O-scale freight equipment for organizations, clubs, and individuals in both 3-rail and 2-rail. 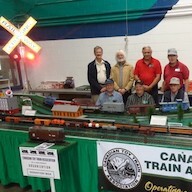 One of those organizations was the Lionel Collectors Association of Canada. In 2002, BCK Graphics Group purchased the decorating assets of Crown Model Products, of Massachusetts (CMP), a long-time, and well-respected, producer of O-scale models and custom run cars. Since then Buffalo Creek Graphics has produced a wide range of custom decorated products for operators and collectors with interests in the classic steam-to-diesel transition era and railroads in the eastern United States, and Canada. Buffalo Creek Graphics markets its custom designs under the Crown Model Decorators tradename and uses American-made Weaver carbodies exclusively. All of our business is based on mail-order and Internet sales only. A complete catalog of available inventory from Buffalo Creek Graphics, including the remaining stock of LCAC Comcars, may be viewed on our website at: www.TrainResource.com. Now part of the Atlas O line, Industrial Rail provides a growing line of economically priced items from train sets to accessories. Originally intended to complement traditional O-27 rolling stock, these sturdy trains can be used with all other O Scale & O-27 gauge products. The most well known, celebrated and iconic manufacturer of O gauge electric trains in North America. Founded in 1900 by Joshua Lionel Cowen, the company’s 3-rail O-27 track, well engineered trains, locomotives & accessories represent where many started playing with Toy Trains. Images of fathers and sons with Toy Train layouts over Christmas is most closely associated with Lionel’s marketing. Lionel has gone through many changes, faced growing competition (Marx, American Flyer, K-Line, MTH) and always innovated with technology. Lionel’s introduction of Trainmaster Command Control (TMCC) in 1994 launched O Gauge model railroading into today’s digital era. TMCC permits operation of multiple trains on the same track without complex wiring, and also gives locomotives realistic digitital RailSounds ™ sound systems. Lionel remains a favourite producer of a full line of locomotives, rolling stock, track, power and accessories. 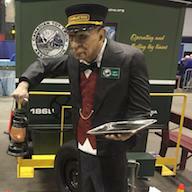 From simple O-27 cars and sets to the state-of-the art Legacy & TMCC Command Control scale model trains we enjoy today. Editor’s note – MTH quickly introduced a burst of Canadian roadname products, most of them never before available as O gauge models. Collectors & operators responded. For CTTA members, the benefit was a wake up call to Lionel and others that there was a growing market for Canadian Toy Trains. Ready Made Trains products feature high quality but affordably priced 0-27/0 gauge trains for the toy train operator and collector. RMT focuses on those toy trains that held a special appeal under the Christmas tree of your youth.The RMT brand offers a wide assortment of toy trains, tracks, buildings and accessories to share this wonderful hobby with your children, grandchildren, family and friends. Many years of actual prototype railroading experience combined with 21st Century manufacturing allows RMT-DIRECT to offer what many toy train hobbyists are calling the best 0-27 gauge toy trains available in today’s marketplace. RMT is currently producing scale and semi-scale rolling stock and locomotives from K-Line tooling they have acquired. RMT also specializes in producing a somewhat whimisical line of shortened locomtives and cars that run on the smallest O-27 curves and layouts. BEEPs (short GEEPS), BEEFS (short F units), PEEPS (shortened passenger cars) and the like provide options for running toy trains in small spaces. USA Trains is a manufacturer of G scale model railroad products that started out as Charles Ro Manufacturing Company. They offer two different scale sizes of trains that use the same track; the “Ultimate Series,” which is 1:29 scale, and the “American” and “Work Trains” series which is 1:24 scale. USA Trains claims to have the largest collection of G scale rolling stock in the world. USA Trains was established in 1987. Editors note – Weaver has announced the closing of its manufacturing business at the end of June, 2015 after 50 years. Quality Craft Models was founded in 1965. What started as an operation producing Wooden Craftsman Kits consisting of buildings, rolling stock, etc., in gauges from N to O, has grown into a major manufacturer of ready-to-run plastic (and brass) “O” Gauge 2-Rail and 3-Rail models. The first location for the business was an old, single story print shop located on Wheatley Avenue in Northumberland, PA. Joe Hayter, current Owner and President of the Company, started in 1969. In 1974, a newer, more modern facility was constructed near the old print shop. The first plastic “O” gauge model produced was the 2-Bay Hopper in 1980. Originally it was offered in 2-Rail only, but in the early to mid 1980’s the hunger for 3-Rail models was answered by offering a choice of 2-Rail or 3-Rail. With the expense involved to have the tooling completed for plastic injection molding, it was decided to get the most out of one mold. Therefore, the 2-Bay Hopper tooling was made in such a way that the side and ends could be interchangeable allowing us to produce a 2-Bay Offset or 2-Bay Ribbed car with regular, peaked or rounded ends. The tooling and injection molding was completed by Train Miniature, located in Chicago. Thus, Weaver Models, a division of Quality Craft Models, was born! Next to join the Weaver Ultra Line Family was our 40′ and 50′ Tank Cars. Again, with careful planning and the removal / addition of sections to the mold, we could inject either size tank from the same mold. Train Miniature also produced this mold for Weaver. Keeping with the times, our tanks were offered in 2-Rail and 3-Rail from the start. The 50′ Rail Box and 4-Bay Centerflows were soon to follow. Poly-X-Co., out of Philipsburg, NJ did the mold work on these two projects. Soon after, Wilhold Company, located in Sunbury, (almost in our back yard) contacted us for our tooling needs. They did a fine job on our next release, the PS-2 Covered Hopper. Then a former Wilhold employee decided to go into business for himself. Being located only 1/2 mile North on the same road from our plant was just too convenient to pass up. Besides, he was very skilled at his trade. 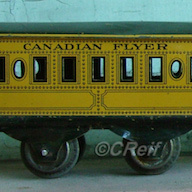 The 3-Bay Coal Car was his first project for Weaver. This formed a tooling relationship that still exists today. The early to mid 80’s also welcomed our first plastic “O” gauge diesel project – the Alco RS-3 Diesel Locomotive. In 1990 the connections were made with Samhongsa to enter into the brass “O” Scale Market. Our first project was the PRR M1a 4-8-2. Approximately 800 to 900 of this model was produced, only about 50 being in 2-Rail. With the lack of other “O” gauge manufacturers, we immediately sold every one. From 1990 to 1993 numerous brass and plastic model projects were successfully marketed by this team. The Samhongsa / Weaver Team also ventured into the plastic market. Numerous plastic diesels were produced: SD40-2, C628, C630, Baldwin Sharks and E8’s. At that time, we were releasing 1,000 to 1,500 diesels per style. About 100 to 200 were offered in 2-Rail, the remainder in 3-Rail. QSI Sound was introduced into the models in late ’91 / early ’92. In the mid 1990’s, Samhongsa made a strong connection with Mike’s Train House. From then on, they would no longer produce anything in “O” scale for anyone other than Mike’s. 49er 4-6-2. By this time, numerous other manufacturers jumped on the “O” Gauge “Band Wagon”, resulting in a variety of choices for the discriminating modeller. Our lower production quantities of 300 3-Rail (225 with sound and 75 without sound) and 50 2-Rail was evidence of this. From then on, we have been releasing two to three brass releases each year. It was later ’92 / early ’93 when we moved into our state of art facility located along Route 11 approximately 1 mile North of Northumberland. That was also the year Joe officially took the “reins” of Weaver Models by purchasing the business. 1995 was also a significant landmark for Weaver as it was the first time we officially published a “Ultra Line” catalog featuring our models produced in-house. Prior to that, the few catalogues released featured one or two brass, Gold Edition, imported models. What started out as a eight page catalog produced one time per year has grown into a 28+ page semi-annual release. Editor’s note – Weaver has produced four CTTA limited-edition Trailer-on-Flatcar (TOFC) models. See our Club Cars page! The recently delivered White Pass & Yukon Route trailer on a CN flatcar (TOFC) was the last custom made rail car made by Weaver. Weaver closed its doors on Saturday, July 18, 2015.